A strange animal that lived on the ocean floor 500 million years ago has been assigned to the tree of life, solving a long-held mystery. 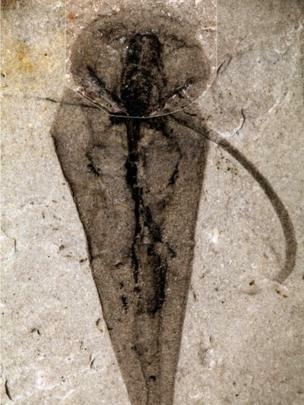 The creature has eluded scientific classification since the first fossil was discovered 175 years ago. The extinct hyolith has a cone-shaped shell, tentacles for feeding and appendages that acted as “feet”. It belongs to an invertebrate group that includes animals such as the horseshoe worm, say scientists. Joseph Moysiuk, of the University of Toronto, made the discovery after analysing more than 1,500 specimens dug out of rocks in Canada and the US. “Hyoliths are small cone-shaped sea dwelling animals. They are known from all around the world, mostly from fossils of their shells,” he told BBC News. “They appear in the fossil record about 530 million years ago and survived until about 250 million years ago. The research, published in the journalNature, analysed soft tissue preserved in “very special fossils” from a site in Canada known as the Burgess Shale. In the past, hyoliths have been interpreted as being related to molluscs, which are common today and include squid, clams and snails. The new research suggests the animals are in fact more closely related to a different group of shell-bearing organisms, known as lophophorata, which includes brachipods (lamp shells), among others. Hyoliths were present from the beginning of the Cambrian period about 540 million years ago, during a rapid burst of evolution that gave rise to most of the major animal groups. “Being able to place them on the tree of life, it solves this long paleontological mystery about what these creatures are,” said Joseph Moysiuk. Dr Martin Smith, of the University of Durham, UK, also worked on the fossils. He said by placing hyoliths in their rightful home and understanding how they lived, scientists now had a better picture of life in the ancient seas. This gives an insight into the impact of mass extinction events such as the Permian-Triassic mass extinction, which wiped out most animal life, including the hyoliths. “Understanding the effects of such mass extinctions on ecology and diversity is particularly important as we seek to appraise and mitigate the implications of the current mass extinction event brought about by human activity,” Dr Smith said. Southampton hold a slender advantage in the EFL Cup semi-final after a fully deserved first-leg victory over Liverpool at St Mary’s.